This is a magnetic suction wireless BT hands-free headset, compatible with most BT-enabled smartphones. It will provide a quiet and comfortable listening experience. 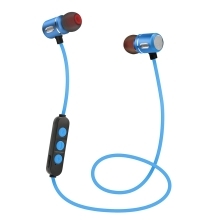 Specially designed with an in-ear style that gives you ultimate comfort and fit. Built-in microphone and it supports hands-free calls function, which is convenient for you to answer the call without holding your phone. Besides, it adopts VC 6.0 noise reduction technology, which will provide clear talk and music sound. Unique design with magnet function which prevents the wire and two heads of earphone twine together. Fashionable in-ear style earphone, specially convenient for wearing when doing sports. Adopts advanced BT4.1 technology, easy to connect with most BT-enabled smartphones. Easy to adjust volume, switch music and answer/hang up the hands-free calls. Perfectly fit to your ears, comfortable to wear for a long time. Supports voice switching in English/Chinese. Supports incoming calls voice broadcast for not missing any important calls. Supports last number of redial/operating voice prompts function. Supports voice software like WeChat/car navigation/QQ. Supports for IOS system showing the battery power. A good choice for you to enjoy wonderful music and convenient hands-free calls.